One of the members of Pensioners for Independence National Hub, our Facebook group page, says that she is always encouraging people to buy Scottish goods. 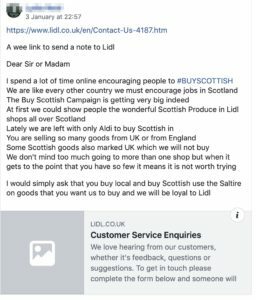 Recently she contacted LIDL about the way they are labelling and branding Scottish produce. And she’s happy for us to show her letter here. This entry was posted in Letter-writing Network on 06/01/2019 by MmH.